Robots working with people need to be able to respond to the slightest touch, so they can react as you would expect a humanoid to react. Two new artificial skins for robots have recently been developed to make this a reality. Chemist Zhenan Bao at Stanford University, California, and her colleagues used the elastic polymer polydimethylsiloxane (PDMS)1. Bao took a piece of PDMS measuring six centimetres square with pyramid-shaped chunks cut out of it at regular intervals. When the PDMS is squashed, the pyramid-shaped holes that were previously filled with air become filled with PDMS, changing the device's capacitance, or its ability to hold an electric charge. 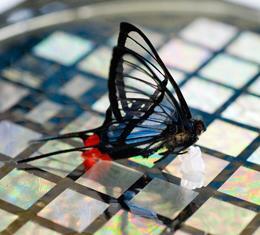 The PDMS-based skin is sensitive to the lightest of touches: Bao tested her device by placing a bluebottle fly and a butterfly on it, both of which were clearly 'felt'. Ali Javey at the University of California, Berkeley used semiconductor nanowires pulled into the shape of a grid using a technique called contact printing. 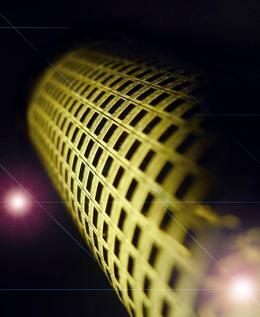 The grid was then laid out on a flexible pressure-sensitive rubber — a material that changes its electrical resistance under pressure2. Update 8-Dec-2011: In Roger Zelazny's Hugo award-winning 1966 novel This Immortal gives sf fans a glimpse of this idea. A wrestling robot uses special skin described as a radar mesentery to sense its opponent. End update.